Distance: 360 km (5 hrs, 30 min.) Drive north through cultivations of sisal and pineapple to the northern frontier district and on to Samburu National Reserve. Afternoon game drive in this reserve famous for its exclusive game viewing. Dinner and overnight at Samburu Serena Lodge or Sarova Shaba Lodge, L,D. Full day of game viewing drives in this dry semi-arid park with its striking background view of the Mathew's Range. The gently flowing Uaso Nyiro river which traverses this Park provides evergreen vegetation for the rare gerenuk, Grevy zebra and reticulated giraffe found in this park. 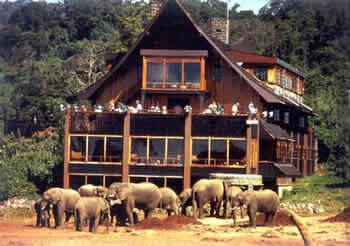 All meals and overnight at Samburu Serena Lodge or Sarova Shaba Lodge, B,L,D. After breakfast at the Lodge. Drive to the Aberdare Country Club. Lunch at the Club. Afternoon transfer into Aberdare National Park and on to The Ark Lodge for bird watching and overnight floodlit game viewing from the lodge viewing decks. Ark Lodge, set in the heart of the Aberdare National Park, is an unique tree lodge with a veranda that overlooks a floodlit waterhole and saltlick allowing undisturbed views of wildlife visiting the waterhole. Elephant, rhino, leopard, bushbuck and occasionally an elusive bongo and giant forest hog have been sighted. The 60 guest rooms are all en-suite. All cabins have private bathrooms with shower, and are comfortably furnished with bedside lamps and carpeted floors to ward off the evening and morning chill. Resembling and named after Noah's Ark, The Ark Tree Lodge is designed with 'decks' from which numerous balconies and lounges provide superb vantage points for game viewing. A ground level bunker provides excellent photographic opportunities and takes you closer than you would believe possible to the wildlife. Dinner and overnight at The Ark Lodge, B,L,D. After breakfast, return to the base hotel. Reconnect with your driver for a drive back to Nairobi to arrive just before lunch where the tour ends, B.